Changthang means Eastern Flat Land; it is the land of nomads located in the east of Leh on the Chinese border. The average altitude of the area is around 14600 m above sea level. This area is also known as Rupsho valley. The main attraction of this area is Changpa nomads, wild animals, lakes and rare birds. 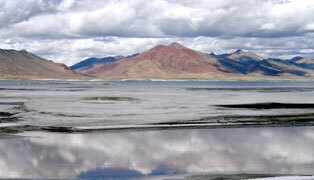 The Tsomoriri Lake is a beautiful mountain bounded expanse of water, around 240 kms from Leh in Rupsho Valley. The Lake is located at 14,000 ft near a small village of Korzok. One can also visit the Korzok Monastery of 19th century that houses Shakyamuni Buddha and other statues. The Nomadic people are the most outstanding feature of this Lake area, which graze herd of goats and yaks. About 76 kms from Tsomoriri is located another beautiful Lake, Tsokar (the salt lake) in this area. 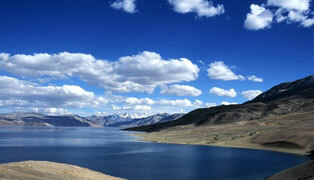 Pangong Lake is 40 miles in length and nearly 2 to 4 miles in width at a height of 4267 m above the sea level. One third of the lake is in India and the rest comes under China. The colour of the water is the most striking feature of this lake that catches the first glance of one’s eyes, especially towards evening, when it is of rich deep blue, over the whole expanse which turns completely light blue at morning time. The water of the Lake is not that salty as sea water but it’s as cold as ice. 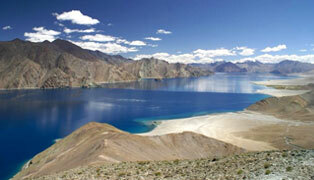 Pangong Tso trip can be organised in two days and overnight stay at Tangtse. Travelers are not allowed to pitch their tents near the Lake and only allowed to go upto Spangmik due to security reasons. The landscape on the way to Pangong is spectacular. Tso Kar Lake also known as ‘White Lake’ and is situated in the Rupshu Plateau and valley in the southern part of Ladakh. It is surrounded by wetlands and lush green meadows. The lake water is brackish. The distance from Leh to Tso Kar Lake is around 135 kilometers and it can be reached within 3 hours from Leh. It has a huge variety of birds for bird watchers. There are large number of grebes and brown-headed gulls, and some strip geese, rust geese and terns. Tso Kar Lake sustains other wildlife such as Kiang, Tibetan gazelles, Tibetan wolves and others. 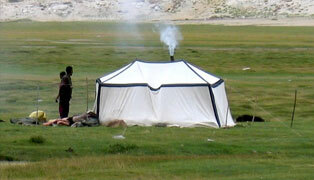 The nomadic community of Samad-Rokchen lives in tents around the lake. Thugjay village is the main station of this nomadic community. Tsokar Lake is one of the trekking routes of Rumtse to Tsomoriri Trek. If you want a peaceful place to feel close to nature, then you should explore Tsokar Lake.